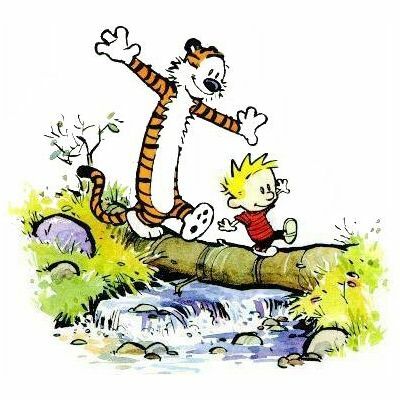 The enchanting, and often quite humorous, story of a six year old boy, Calvin, and his best friend tiger, Hobbes. Luckily Calvin's parents (Mom and Dad) think Hobbes is a stuffed tiger. Their endless adventures include scientific progress, dinosaurs, aliens, Space Man Spiff, Tracer Bullet, long walks in the woods, camping with the parents, their top secret club G.R.O.S.S (Git Rid of Slimy girlS), and the simple things in life like Christmas morning or sledding in the snow. Written by artist and author Bill Watterson from 1985 to 1995.